This is a version of a cake made at Lenotre, the famous Parisian pastry shop. It is a lot of "patchki" but it is very elegant and very festive. Separate 5 eggs into 2 large mixer bowls. To the yolks add 4 whole eggs and 1 cup sugar. Beat until thick and pale. Fold in flour. Beat 5 egg whites until foamy, add salt and cream of tartar and beat until soft peaks form. Add 3 tbs. sugar, one at a time and beat until stiff shiny peaks form. Fold egg whites into egg yolks mixture. Lightly spray with Pam two 15 x 10 inch cookie sheets, line them with parchment paper. Spread batter 1/4 inch deep, smoothing top of batter evenly with spatula. Divide remaining batter into two 9-inch cake pans, which you sprayed and lined with parchment paper. Bake in a preheated 425° oven, the cookie sheets for 3-4 minutes and the cake pans for 4-5 minutes. Bake only until lightly brown. 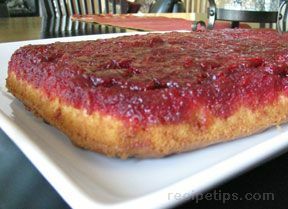 Loosen edges of sheet cakes with metal spatula and carefully turn out on cotton dish towel dusted with powdered sugar. Using jelly roll technique, roll towels lengthwise into tight roll. cool layers. Spray with Pam a 1 1/2 quart bowl, line with plastic wrap. Using very sharp straight-edged knife, cut frozen jelly roll into 1/4-inch slices. Line bowl with pinwheel slices, starting at bottom of bowl, lightly press slices as close together as possible. Spoon Bavarois cream into bowl, place a round cake layer on top. Cover and chill overnight. Several hours before serving, turn cake onto serving platter. Tug gently at plastic wrap to remove cake from bowl. Melt apricot preserve and generously brush cake. 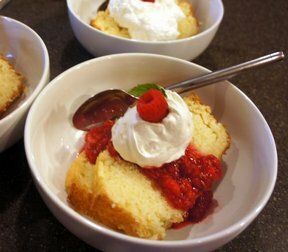 Refrigerate, Before serving, encircle cake with extra pinwheel slices, serve with raspberry sauce.